OUTSIDERS dressed in traditional clothes and headgear, and high on endless glasses of bhang-laced thandai, incite the daughters-in-law from a suburban town of Mathura with snatches of ribald rhymes and double entendre. 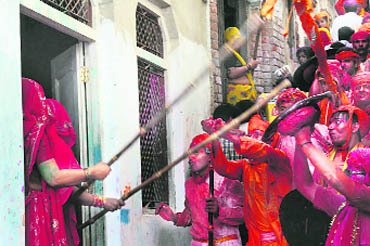 It ends up with the veiled women chasing the men away by hitting them with batons or lathis. The men good-humoredly protect themselves with makeshift shields. This is no fresh incident of mass molestation in Maya’s Uttar Pradesh. It is, in fact, the traditional Lathmar Holi played in Barsana, a suburban town some 42 km from Mathura in western Uttar Pradesh, every year. Said to be the birthplace of Radha, the beloved of cowherd Lord Krishna, this ritual, breaking all acceptable social norms, enacts out the fun and frolic of the legendary couple. Lathmar Holi, a special form of the traditional festivity, takes place well before the actual Holi. While a similar celebration is witnessed across several villages of Mathura, the one at Barsana is the most famous. It is associated with the town that has the distinction of having the only temple dedicated to Radha in India. Festivities begin from the first day of the Phalgun Shukla Paksha (waxing phase of moon). Legend has it that Lord Krishna, along with his friends, visited beloved Radha's village on this day and teased her and her friends, traditionally called the gopis. Seemingly taking offence at this, the women of Barsana chased him away. Since then, men from Lord Krishna's Nandgaon village visit Barsana to play Holi and the age-old drama is enacted. There is, however, no sociological study available of this ritual, wherein both men and women release their suppressed emotions. The main festivities are in the sprawling compound of the Radha Rani Temple. After the prayers, the gopis from Nandgaon march out of the temple on Rang Rangeeli Gali, where they stop to play Holi with the gopis, who stand in groups along the street. Endless glasses of bhang-laced thandai loosen the tongues. The air is thick with scented flowers, abundant in the spring season, and the aroma of perfume. Rose petals and coloured powder are rained on the visiting pilgrims. Coarse language, that is objectionable in public with women on a normal day, is freely indulged in, creating an air of bawdy merriment. For the men, it is a euphoric experience, heightened by its forbidden nature. It proves to be a great way for de-stressing and male bonding. It is said that the women of Barsana start preparing for this day more than a month in advance. The mothers-in-law feed their daughters-in-law with nutritious food so that they can show off their dexterity with the lathis on the Holi battleground. It is a strange show of playful animosity. It is said that no daughter from the village takes part in this annual ritual. Incidentally, no marriages between these two places take place, reportedly to save the men from Nandgaon from indulging in uncouth behaviour with their daughters and sisters and getting beaten up in return. THE Nahan (pronounced as Nhan) is a unique Holi extravaganza celebrated in the Hadoti region of Rajasthan. Organised by the local Nhan Samiti, the 10-day celebrations at Sangod, 50 km from Kota, become a hub of colourful activity. The extravaganza starts on the second day after Holi, wherein gaudily dressed eunuchs (kinnars) are a special attraction. Sangod comes alive with the folklore and traditional colours of Nhan. The main attraction is the Swang, which can be compared to the modern-day fancy dress competition. The villagers dress up in colourful attires, enacting different themes and even make strange gestures to the cheering of the local crowd. The events include swallowing snakes and daggers, sliding over a 100-feet-high road gradient, singing, dancing, acrobatics and black magic. 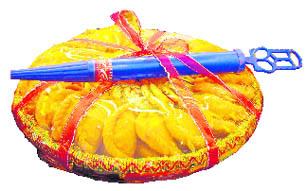 Traditionally, on the first Teej and on the fourth day, the Bazaar ka nhan are organised; subsequently a holiday is observed on the day of Rangpanchami. On the sixth and the seventh day, the Khaade ka nhan is celebrated. The first day also features the special barah bhale ki sawari, which is taken out through the streets with dancing folk artistes, comedians (Rao Umrao) and local musclemen in colorful action. 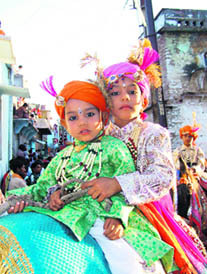 The concluding attraction of the procession is the Badshah (played by children) riding a (duplicate) hathi ki palki, wearing gold ornaments. Artist Abdul Hanif from Kota informs that "Nahan is observed every year during Holi in honour of a valourous Gujjar named Sanga, who sacrificed his life in the 15th century on the fifth day of Holi (Panchmi) fighting the warriors from 12 kasbaas. The event was started in his memory on his martydom day in 1601. Eunuchs from far-flung places participate in the fanfare. 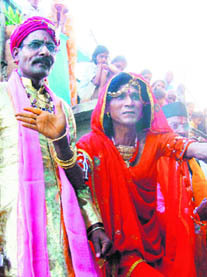 Folk artiste Lalit Bhartiya informs that "the eunuchs consider the participation as a prestigious event. The kinnars are believed to worship Mata Brahmani and the Nahan processions take off from the Brahmani Mata Mandir." Magicians display their best skills, go round the city and entertain one and all. Villagers travel from far and wide in groups on tractors and the like to participate in the Nahan Mela. The tying of the bullockcart wheel with plain thread, black magic and hanging of the clay pot with a lemon and hung knife, dev viman, amusing dancers by the kinnars etc make the Sangod Nahan post- Holi fiesta memorable indeed. Besides the rang of abeer and gulal that marks the festival of Holi in other parts of the country, it is classical music that gives an additional dash of colour to the celebrations in the Kumaon Himalayas. The unique aspect of the Kumaoni Holi is that the celebrations last for almost three months. They begin with the month of Paush and conclude on Dhulendi. Veteran cultural artiste and activist from the region, Zahoor Alam, says that there are three different forms of Holi that mark the celebrations in this part of the country. The first is the Baithaki Holi, in which classical compositions are rendered at sittings organised throughout the three-month period. Then, there is the Khadi Holi, in which the people sing and dance while moving from one house to another. The celebration of this form of Holi starts a week prior to Dhulendi. The third form, of course, is the symbolic burning of Holika on the eve of Dhulendi and the playing of colour the next day. 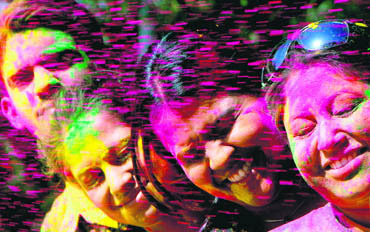 "Baithaki Holi used to be very popular, particularly in the urban areas, in the past. 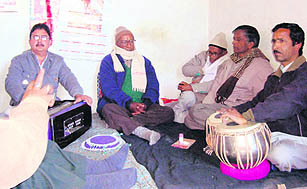 With the extreme cold climate allowing very little work to be done, baithaks used to be organised in one corner of the huge houses, where classical compositions were sung throughout the night. The corner where these sittings were organised was known as Gammaj. The best of food was offered to those attending the baithaks. The traditional offering marking these sittings were aloo gutkas and gujjiyas," says Alam. The beauty of these baithaks is that the singers rendering classical music have received no formal training in singing. It is while attending these baithaks over the years that they have picked up the art. Normally, one singer starts a rendition and then it is picked up by the others and over the years, many skilled Holiyars (those who sing Holi) have come into being. The uniqueness lies in the rendering of Holi songs in the classical format of thumri. A unique instrument that accompanies the harmonium and tabla in the Baithaki Holi is the lota that is struck with a coin to give a beat to the song being rendered. Interestingly, the genesis of Baithaki Holi goes back to the mid-19th century, when renowned musician and singer Ustad Amanullah Khan brought it to Almora from Rampur somewhere in the decade 1850-60. A woman named Rampyari had played a very important part in taking forward the legacy of Ustad Amanullah Khan. The songs that are rendered at the Baithaki Holi include the verses composed not only by Surdas, Meera, Kabir and Tulsi but also by Charu Chandra Pandey and Maheshanand Gaur. In recent times, artistes like Shivcharan Pande, Gangithok, Chandra Singh Nyal, Bhagwan Singh Nyal, Mohan Singh, Ghulam Ustad, Lali Ustad, Mohan Rais, Puran Chandra Pandey, Moti Ram Ustad, Uday Lal Sah and Jawahar Lal Sah have contributed a lot to keep the rich tradition alive. Folk poet and social activist Girish Tewari, fondly known as Girda, who passed away last year, had given a new dimension to Holi in the region. 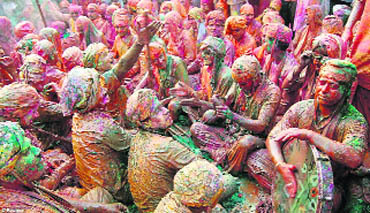 Girda’s friends relate that he linked Holi with the spread of strong social messages. In traditional Kumaoni style of giving best wishes to the guests during Holi, he used to hit out on local, regional, national and even international issues. His Holi wishes were full of sarcasm, as they dealt with issues like the United States bombing Iraq or corruption at the local level. Over the years, the Holiyars have chosen to spread social awakening through their Baithaki Holi presentations. These messages can be against alcoholism, discrimination against girls or adaptation of western culture. Cultural troupe Yugmanch has contributed a lot to the revival of the Kumaoni Holi, which was fast losing its hold. Alam says that all ills that have been spoiling Holi in the plains had started making their presence felt in the region, too. Hence, it was in the mid-1990s that Yugmanch started organising the festivities and once again made popular the Baithaki and the Khadi Holis of Kumaon. "Once people were reintroduced to their rich culture, they lapped it up. Today, the Hukka Club of Almora has made a big name for itself not only in Uttarakhand but also in other states. The Khadi Holi, which used to be very popular in the rural areas, has found a large number of takers in the urban areas as well. Hence, the symbolic burning of Holika and the splash of colour on Dhulendi just mark the culmination of a three-month-long musical celebration of the Festival of Colours. The residents of this region proudly say that it is only the celebrations in Barsana that come close to the Kumaoni Holi.